I had seen her 3 months earlier for her tracheostomy tube which had been removed and she had completely normal vocal cords at that point. The swelling beneath her vocal cords is from the previous tracheostomy tube scar. She then developed hoarseness, which I would attribute to using a Flovent inhaler. She developed a fairly invasive fungal laryngitis. 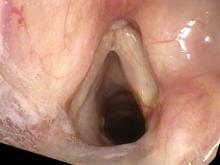 View with Pentax high definition endoscope. 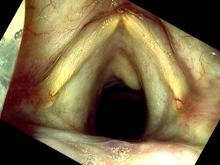 The white bumps on the vocal cord surfaces represent the fungus. 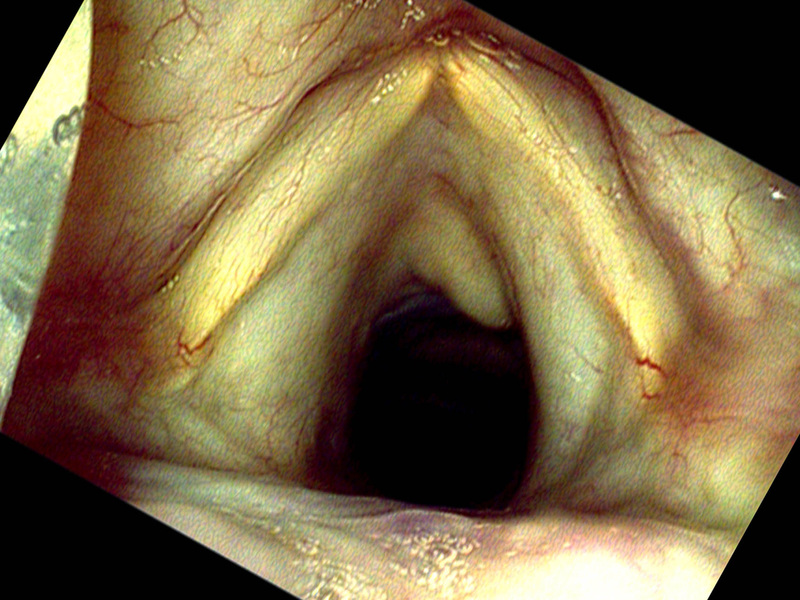 Another view with the Pentax high definition endoscope using selective color imaging to emphasize the vasculature. She was treated with fluconazole, 100mg per day for one month and her vocal cords returned to normal. View with a Pentax high definition and scope. No visible fungal elements. Hoarseness while on one of the potent steroid inhalers would put a vocal cord surface fungal infection high up in my differential diagnosis list.